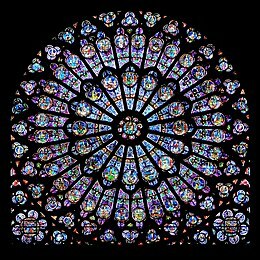 Rayonnant rose windae in Notre Dame de Paris. In Gothic airchitectur, licht wis conseedert the maist beautifu revelation of God. Beauty is a chairacteristic o an ainimal, idea, object, person or place that provides a perceptual experience o pleisur or satisfaction. This page wis last eeditit on 23 September 2017, at 05:56.